The “Jungle Cruise” attraction at Walt Disney World is a riverboat ride that takes guests on an exciting trip on board a replica of an open air canopied tramp steamer for a journey on the Amazon, Nile, and Mekong Rivers of South America, Africa, and Southeast Asia. This 10-minute journey will take passengers into the jungles of Africa, the rainforests of South America, and the mystery and beauty of Southeast Asia. Along the way travelers will observe exotic animals, serene waterfalls, nature’s beautiful creations, and other exciting sights and sounds. Travelers will observe hungry lions, enormous alligators and hippos, wild elephants, and even a tribe of headhunters. Your Skipper will describe each fascinating scene with their personal wit and wisdom. This is an adventure that will excite and entertain the whole family. 1. The Rivers — The muddy look of the water on the “Jungle Cruise” attraction is actually man-made, and here is how it works. Located behind the attraction is a pumping station that supplies all the water for the attraction. A special dye is placed in the water, which is dispensed into the river by a waterfall. As the boats make their way around the rivers first thing in the morning, they act as blenders, mixing the dye through the waters. This dye has two purposes. It gives the water a more realistic look and also hides the fact that the boats are on tracks and conceals the mechanics of the animatronic animals that are in the water. 2. Airplane Crashes in the Jungle – Shortly before the construction of the “Great Movie Ride” at Hollywood Studios, Disney purchased a WWII vintage Lockheed Model Electra Junior airplane to be used in a scene from the classic movie, “Casablanca”. Because the plane would not fit into the scene, it was cut in half and only the front part was used. The back part was put on display in the “Studio Backlot Tour”. Later the plane was removed and placed in the “Jungle Cruise” attraction. After you pass Schweitzer Falls, look on the right hand side, and you will see this almost hidden dilapidated crashed airplane surrounded by years of growing jungle foliage. 3. High-Tech Special Effects? — Every Disney theme park uses state-of-the-art technology as an integral component of each and every attraction. Here’s an interesting tidbit about the absence of technology in one area of this attraction. Just as your boat is entering the ancient Cambodian Temple, on the left you will be greeted by a large ferocious tiger staring at you with eerily glowing eyes. Well, Disney found a way to make those eyes glow without advanced technology. They simply used marbles for eyes and painted them with a reflective coating. How ingenious is that? 4. S.O.S. from a Sinking Boat — In May, 2004, one of the “Jungle Cruise” boats (the Sankuru Sadie) began taking on water about halfway through the ride. The skipper actually used a guest’s cell phone to call for assistance. No one was hurt and all the passengers made it off the boat safely. The ride was closed for the rest of the day, but re-opened shortly after that. 5. Three Very Special Canoes — Shortly after your trip begins, you will notice three extraordinary canoes along the shore on the right hand side. These unique canoes belong to three very famous Disney characters. The one who is in the middle with the beak belongs to Donald Duck; the one on the left with the pointy horns belongs to Goofy, and the canoe on the right with the curved horns and blue face belongs to none other than Mickey Mouse. The next time you take a ride on the “Jungle Cruise” attraction, keep an eye out for these comical looking canoes. 6. Audio-Animatronic Animals in the Water — We all know that electricity and water do not mix, so what kind of power is being used to control the movements of the jungle inhabitants that are in or around the water? The answer is a technique called a pneumatic system that pushes compressed air through a cylinder which creates the animation in the animals. Take, for instance, the hissing and bubbles coming from the hippos in the hippo pool. It’s actually the compressed air being released. There is zero chance of electric shock to the animals or humans. 7. High-Tech Lasers —There are laser sensors hidden along the rivers of the “Jungle Cruise”, and when a boat passes by one of these sensors, it signals a special effect to go off. This includes all those exotic sound effects, native headhunters who suddenly appear out of nowhere, and (spoiler alert) you don’t have to worry about being drenched by a playful elephant. As the boat approaches the mischievous pachyderm, it slows down to signal the sensor to have the elephant stop spraying the water. 8. Jungle Cruise/Jingle Cruise — If you have been lucky enough to visit Walt Disney World at Christmastime, you were treated to a very special “Jingle Cruise” adventure. The entire attraction is decked out in Holiday decorations and props. 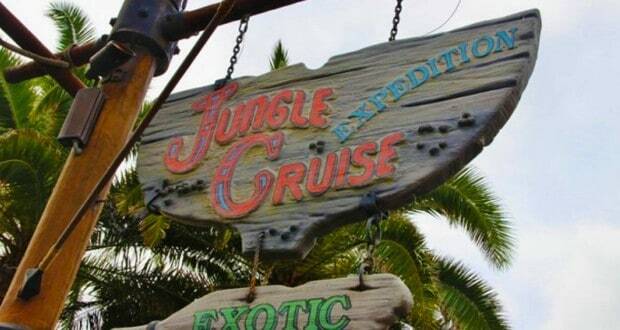 Even the sign over the attraction is edited to read, “Jingle Cruise”. The cast members wear jungle-inspired Santa Claus hats, and all through the ride Holiday props have been added to many of the scenes. There are even large Christmas presents floating in the water. If you get a chance to ride the “Jingle Cruise”, have a “holly jolly” good time. 9. The Legend of “Trader Sam” — At the very end of the “Jungle Cruise” ride, your Skipper will draw your attention to a native tribesman whom they have given the name, “Trader Sam”. He is a quirky fellow and the “head” salesman of the jungle, offering guests “two of his shrunken heads for one of theirs”. One more interesting rumor is that the color and design of his outfit resembles the red and white stripes of the original “Jungle Cruise” boats before they changed to a more subdued khaki look. It sounds like something Disney would do. 1. Orientation—Learning all about the Magic Kingdom, especially Adventureland/Liberty Square attractions—lots of walking and listening to guides talk about the history of WDW. g. Memorizing a 25-page script—Disney requires every “Jungle Cruise” Skipper to stick to a uniform script made up of information, “bad jokes”, and humorous banter. i. Testing—A Disney Manager will take a ride on your boat and grade you on delivering your “spiel”, loading and unloading the boat, driving the boat, etc. k. Exam—There is a paper exam covering all aspects of working on the “Jungle Cruise’ attraction, followed by an informative meeting with an area Manager for final assessment. The “Jungle Cruise” attraction was one of the original attractions operating on the opening date, October 1, 1971. It is still a very popular ride and still family friendly. There are so many sights and sounds to give guests a real sense of being on a boat ride through the jungle. The Skippers are lively and interact with the audience with “bad jokes” and humorous stories. It’s exciting, fun, and a boat ride like no other. I am a working mother of four adult children, 2 granddogs, and one grandcat. I have been a Disney fanatic since 1959, when my parents took my sister and I on a journey across the country to Disneyland. Needless to say, we were thrilled, and this became our vacation destination for the next 10 years. Later, when Walt Disney World was opened, we travelled to Florida and discovered a whole new Disney experience, and WDW became our new vacation destination. Now, our extended family members are all Disney Fanatics and always ready to talk about anything Disney.